If you’re a business in 2018, you’ve likely dabbled in keyword research. Maybe you know four or five terms that best represent your business, but nothing really more than that. This definitely is better than no keyword research at all, but consider this: in a 2018 survey conducted by Content Marketing Institute asking 195 for-profit, B2C businesses about what contributed to their success with content marketing, 75% of companies reported having an organized strategy as the main contribution. 146 out of 195 businesses ranging in size and industry cite having a strategy as the main reason for having success with content marketing… That’s way too common of a trait to ignore. “Organized strategy” might sound scary to some people, firing off visions of bi-hourly projections and cascading excel sheets. While there’s nothing wrong with a strategy like this (the more measured, the better), effective content marketing strategies can be as simple as having a foundation of accurate keyword research. In fact, you can put together a data-backed list of keyword research with nothing but free tools provided by Google in less than 20 minutes. People reveal more to Google than they do to their closest friends or family members. As a business, if you understand what keywords or key phrases your target audience are searching for, you can create relevant content that applies to these keywords or key phrases with the intention of getting your business in front of interested, eager customers. This, in essence, is the purpose of SEO. 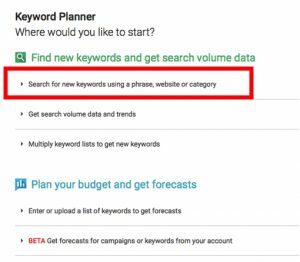 With this in mind, use Google Keyword Planner to find the most popular keywords and key phrases your target audience are searching for. From your AdWords home screen, click on the wrench in the upper right corner. Choose “Keyword Planner”. 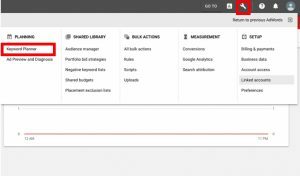 Under the section “Find new keywords and get search volume data”, choose the option “Search for new keywords using a phrase, website, or category. Now you have the option to enter a key phrase, a website URL, or a general category relating to your business. You can also customize the results to only see keywords used in a specific location or within a specific time range. (caption) In this case, I want to see what keywords are being searched for in relation to the topic of “digital marketing”. Unless you plan to do paid advertising, ignore Suggested Bid. Pay attention to Volume and Competition. The volume will give you an idea of which terms have enough monthly traffic to pursue, and Competition will give you an idea of which terms are easier to rank for (low competition) and which terms are harder to rank for (high competition). “Digital marketing” represents just one possible base keyword. If you are a digital marketing business, surely you can repeat the process above with other base keywords like “social media marketing” and “content marketing”, noting all the related keywords for each base keyword. After completing this process with as many base keywords as you can think of, your keyword research should consist of a list ranging in the thousands, if not tens of thousands. There are so many keywords! Where should I start? The term “digital marketing” produced 698 related keywords. 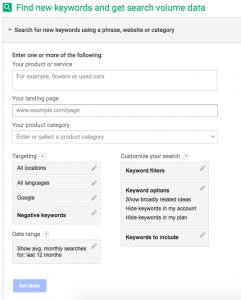 Now it’s time to figure out which keywords you should pursue first. Hit the Download arrow located at the bottom of this screen. When prompted, choose Excel CSV as your download format. Open up your CSV in Google Sheets (or Excel, whatever floats your boat). Note which column contains the monthly traffic for each keyword. (caption) In this case, monthly traffic is located in Column C.
Highlight the entire spreadsheet, go to Data on the topic of your screen, and click “Sort Range”. Select the column containing monthly traffic, choose option “A-Z”, and click “Sort”. This will organize your keywords in descending order from highest monthly traffic to lowest monthly traffic. So now you know which of your keywords have the highest monthly traffic. The next and final step is to find out which of your keywords have the least amount of competition. Begin by highlighting the group of rows containing your highest trafficked keywords. After highlighting, repeat the process described above, now using the column containing keyword Competition and choosing option “Z-A” before clicking “Sort”. Repeat this process for each group of keywords, one after the other (1M – 10M, 100K – 1M, 10K – 100K, and so on). Congrats! You now have an organized spreadsheet telling you the most popular keywords being searched for in and around your industry and which of those keywords are the easiest to rank for. 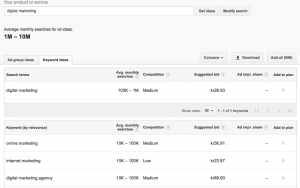 Google Keyword Planner calculates how competitive a particular keyword is based on how many people are bidding on it. This certainly gives you a good idea about how important the term is considered by the people in your industry, but not necessarily how many people are trying to rank for the term organically (like you are). While it’s slightly more time consuming, if you want to gain a clearer picture of the level of organic competition for a particular term, you can use the following clever strategy from process.st. 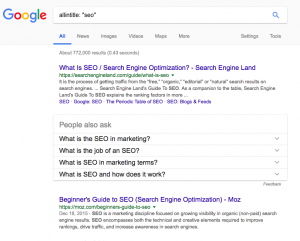 Here you are searching for all indexed results on Google containing your chosen keyword in the title, body text, and/or anchor text. The more results come back, the more people are likely trying to rank for that keyword. Compare this keyword’s results with the results of different variations of the same keyword (“optimal digital marketing strategies” instead of “best digital marketing strategies”, for example). If you’re worried about having to contend with a lot of competition, pursue the variation of your keyword that produces the least amount of search results. This way, you have a better chance of ranking. With data-backed keyword research at your disposal and an understanding of what your target audience is searching for on Google, you can confidently begin putting together an editorial calendar filled with awesome content your audience actually wants to read. Sam Elsley is a Digital Marketing Coordinator at TagScout – a Toronto-based Instagram and influencer marketing service. Sam works with business of all sizes and industries to help them develop sustainable and manageable growth strategies on social media. Learn more about growth strategies here.